With the current low levels of inflation in developed countries, most consumers and even small business owners are largely unaware and unconcerned with the issue of inflation and currency fluctuation. With most currencies more stable than ever in the 21st century, fears of wild inflation seem to be limited only to developing nations and the distant past. However, even small changes in a currencies value can have a ripple effect that causes massive changes in all businesses across the world. The most readily apparent example of this is in the case of petroleum. For various historical and political reasons, all petroleum in the world today is traded on a dollar-per-barrel basis, even if the oil never sets foot in the United States. This means that anything that causes the value of a dollar to go down (i.e. inflation) will cause an increase in the price of oil, even if the supply remains the same. Conversely, a strong dollar will cause oil prices to fall. It was this inflation, which triggered the oil crisis of the 1970s. Oil producing countries (primarily in the Middle East) were upset that because the Dollar was inflating rapidly that meant that their revenues in their own currencies was falling so they decreased supply via embargoes in order to force prices up. Currently, the strong dollar is helping keep oil prices low, much to the consternation of nations dependent on oil sales, such as Russia and Venezuela. But for every loser due to low oil prices, there are numerous winners. Low energy costs benefit transportation companies like airlines and shipping companies whose major costs are dependent on the prices of petroleum. This means that companies like Delta Airlines, FedEx, Ryder and lesser known companies like a Dayton Flatbed Trucking will perform better due to lower energy costs. But it isn’t just oil markets that are influenced by inflation and currency fluctuations. 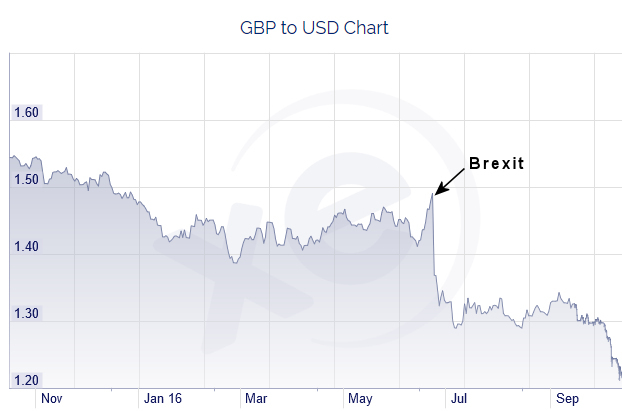 For example, as we can see in the chart to the left, the Brexit vote has caused the value of the British pound to collapse. But, once again, there are both winners and losers due to this massive fluctuation. Interestingly, since England produces much of its own oil in the North Sea, the decline in the Pound has not had the same effect as it would have if Britain was a massive oil importing nation. Thus it hasn’t drastically increased the fuel costs for businesses carrying English goods through the Chunnel to French customers. But, it has greatly increased demand for English hardware, since Euro-holding customers can now buy more with less. It has also boosted the tourism industry in England as travelers get more for their money. Sometimes it both helps and hurts a business at the same time, since even though demand for their product is up, if they are dependent on supplies from the continent their costs will be up as well, which could result in selling at a loss or having to increase prices. Price increases could negate your overseas advantage while simultaneously hurting your local customers. Most notably this has negatively affected the food industry, as the UK has had to import much of its food supply since the 19th century, due to the bad weather and short growing season endemic to England. With stiff safety regulations keeping out much of the food produced in America and Africa, restaurants and grocery stores must either increase prices or simply stop stocking certain items to maintain a healthy profit margin. This has put a strain on the already troubled British economy, as increases in food prices hit the smallest businesses and poorest customers hardest, threatening to do serious long-term damage to the sector of the economy most dependent on low prices. Unfortunately, inflation and currency fluctuations are not at the top of a small business’ radar and so even though they are currently producing a good product at an economical cost, they can be blindsided by these hidden factors that are totally beyond their control. So if your business sells to, or imports from, overseas customers it is often prudent to hedge against currency fluctuations.